Award-winning writer Jaki McCarrick dramatizes Irish history: Five young women set sail from Belfast in 1850 bound for Australia during the Irish Famine, hopeful they will find a fresh start in a new land. Love, adventure and betrayal await them as dirty secrets are revealed and the Belfast Girls are forced to come to terms with the disasters they have left behind. "...McKarrick's story � which she is hoping to turn into a film � is undeniably important. But currently, it also has a bit of a stiff structure. The first act unfolds more as a character study of the five women. There's Judith (McKenzie Chinn), the daughter of a Jamaican woman and Irish man who is de facto den mother for the group. There's tough Ellen (Lindsay Tornquist), songbird Hannah (Caitlin Chuckta), sold by her own father for the price of drinks, and dreamy country girl Sarah Jane (Patty Malaney), whose letters from her already-in-Australia brother spur the women on. And there's mysterious Molly (Cassandra Schiano), whose book learning and good manners seem out of place, even for a former domestic servant." "...It's a fascinating, horrifying slice of Irish history (some 4,000 women took this journey between 1848 and 1851), but McCarrick can't bring it credibly to life. In act one she devotes all her time to outlining her characters and their historical moment, forgetting to let something happen. Overcompensating, she turns act two into a mad, melodramatic rush of personal crises and emotional implosions. Artemisia director Julie Proudfoot's honorable cast go down swinging." "...Artemisia's introduction of this award-and-accolade-winning play to audiences on this side of the Atlantic might be a humble one, but the strength of McCarrick's themes point to the likelihood of its becoming a popular addition to the regional circuit. Why wait until that comes to pass, though, when you can see it now?" "...The play is not packed with excitement-the characters themselves point out that they're not the ones causing the ship to move-but it is far from boring, and provides a fine study of characters and their world." 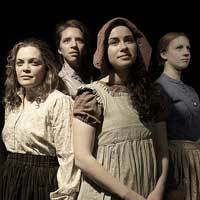 "...Ultimately, I am not sure if this play succeeds in exploring the plight of women migrants during the Irish famine. Like so many plays exploring the plight of women in specific historical contexts, the men with whom they interact, or at whose mercy find themselves, are off-stage character�s: degenerate and patriarchal, and for the most part, we are glad not to see them, but to a certain extent we need to. They play a crucial role in the story and must have had their own subjectivities which would be worth representing on stage however distasteful we find their actions." "...This first full production by Artemisia is directed with assurance by Julie Proudfoot. The action is brisk and thoughtful, made claustrophobic by the small cabin of the ship in which the ladies live. Costumes, hair and makeup by Alice Broughton and Angela Driskill complete the effect of an army of determined, nineteenth century women on the brink of making their new lives in a new world." "...Each of the talented ensemble puts her heart and soul in to connecting the audience to her story. By the time the ship docks, we are bonded to each of these girls. We know their stories. We've watched them change over time. They stand side by side on the pier bravely awaiting their fate. They are less hopeful than when they left Belfast. Yet, they are scrappy and optimistic. And I get misty imagining what lies ahead for these pioneering women."